This book would be great to put by your bedside and read a chapter or two a night or pickup and read through on a weekend! Jacob designed it so it would fit into a cargo pants pocket and it is a perfect fit! The first of a series, it will be great to follow on with Joseph and his dad’s great letters in "The Torch"! 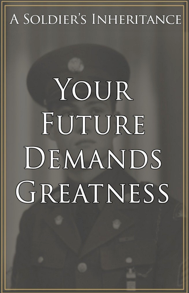 "Your Future Demands Greatness" can be found on Amazon and is available in a Kindle edition! I think you would enjoy other book reviews on MilitaryAvenue's Our Letters to You. Read this on my Kindle!! I love it so far!!! Thanks for the review.